There is something about turtleneck tops that makes them very feminine. The best part is that you can either dress them up or down with the right accessories. I love the short-sleeve turtlenecks as they are a great piece for transitioning into fall. In addition, burgundy is a great color for the fall season. Luckily, the weather is still on the warm side in Vegas, so no capes and sweaters yet. 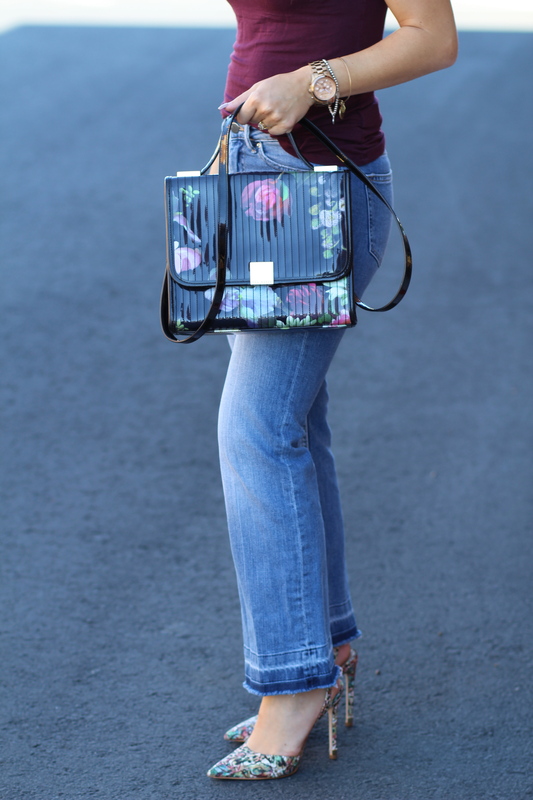 The highlight of this outfit as you can see is this cute vintage lady-like Ted Baker bag. I actually got it second-hand for only $40, and it is in a great condition. This was a true steal! Not to mention that I found these jeans on sale at H&M for only$10. All in all, this whole outfit including a designer bag, shoes and accessories (minus my watch) is less than $100!